When contraction comes from bad shoeing or from standing on hard floors, pull the shoes off, pare down the foot as much as you can, leaving the frog as large as it is. 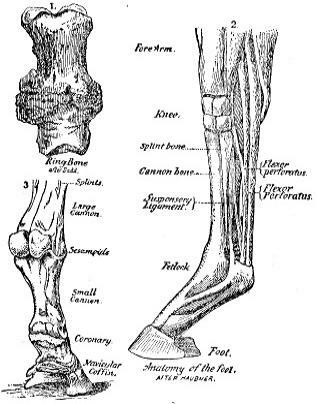 Rub in some hoof ointment once a day at the coronet and quarters, and turn the horse out in a wet pasture. But if the horse must be used on the road, proceed to shoe as follows: First, ascertain if the frog is hard or soft. If soft, put on a bar shoe with open bar. I have invented a shoe for this purpose. See Figure 2, No. I. The idea of shoeing with an endless bar shoe is wrong. 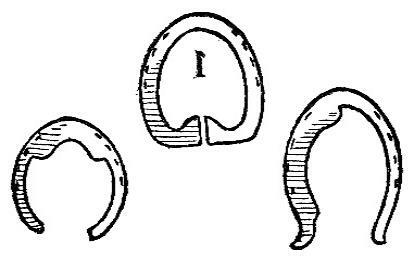 In most cases contraction is brought on by letting the shoes stay on too long, whereby the hoof has been compelled to grow down with the shape of the shoe. If an open shoe has helped to bring on contraction, much more so will a bar shoe, which will tie the hoof to the shoe with no chance of spreading, no matter what frog pressure is put on. Make the shoe as light as you can, with very low or no calks; let the bar rest against the frog; keep the hoofs moist with hoof ointment; use an open bar shoe. Make a low box and fill it with wet manure, mud or clay, and let the horse stand in it when convenient, to soften the hoofs. Spread the shoe a little every week to help the hoofs out, or the shoes will prevent what the frog pressure aims to do, but this spreading must be done with care. If the frog is dried up and hard, don't put on a bar shoe, as it will do more harm than good. In such a case make a common shoe with low or no calks; make holes in it as far back as you can nail; spread them with care a little every week. Let the horse stand in a box with mud or manure, even warm water, for a few hours at a time, and keep the hoofs moist with hoof ointment. In either case do not let the shoe stay on longer than four weeks at a time. In addition to the above pack the feet with some wet packing, or a sponge can be applied to the feet and held in position by some of the many inventions for this purpose. No man can comprehend how much a horse suffers from contraction when his feet are hoof bound and pressed together as if they were in a vise. The pain from a pair of hard and tight boots on a man is nothing compared to the agony endured by this noble and silent sufferer. It must be remembered that there is no such a thing as shoeing for contraction. Contraction is brought on by artificial living and shoeing. A bar shoe for contraction is the most foolish thing to imagine. The pressure intended on the frog is a dead pressure, and in a few days it will settle itself so that there is no pressure at all. If a bar shoe is to be used it must be an open bar shoe like the one referred to. This shoe will give a live pressure, and if made of steel will spring up against the frog at every step and it can be spread. I will say, however, that I don't recommend spreading, for it will part if not done with care. It is better to drive the shoe on with only four or five nails, and set them over often. Contraction never affects the bind feet because of the moisture they receive. This should suggest to every shoer that moisture is better than shoes.